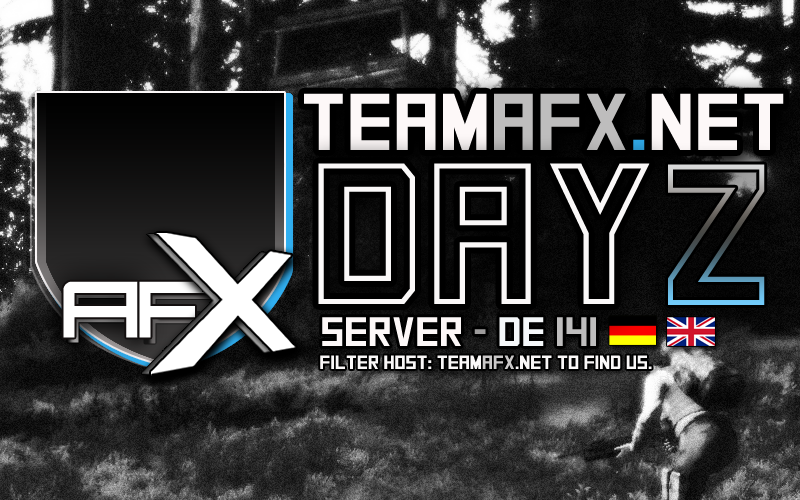 If you've visited our site after playing on our DayZ server then Welcome to teamafx.net, we are a close knit EU based community thats been playing together since 2004. Our DayZ server is currently DE 141 and has been up for just under a week now - please note our old Germany 16 server has been discontinued. Our dedicated server box is located in Germany hence the DE 141 instanceID but as you may have noticed we are an English speaking community. Please use English both on our site and the server Direct Comms/Chat. Please signup and check out our DayZ forums for server support, naming and shaming Alt+F4'ers or simply just to say Hi and introduce yourself. Any active forums members are welcome to join our squad in DayZ. We generally run with between 3 to (potentially) 10 players and are open to new players teaming up with us. You can also connect to our teamspeak and socialise on the public channel or create your on private channel to use with your friends/squads. Most teamafx members hangout there also so feel free to come say hi or to ask for instant server support - in the case of hackers etc.